How do you balance immediate pressure for development with the understanding that in the long-term, a site will be subject to regular flooding? The key lies in linking a vision for the built-out 100 Acre District with the ability to build in the District today. 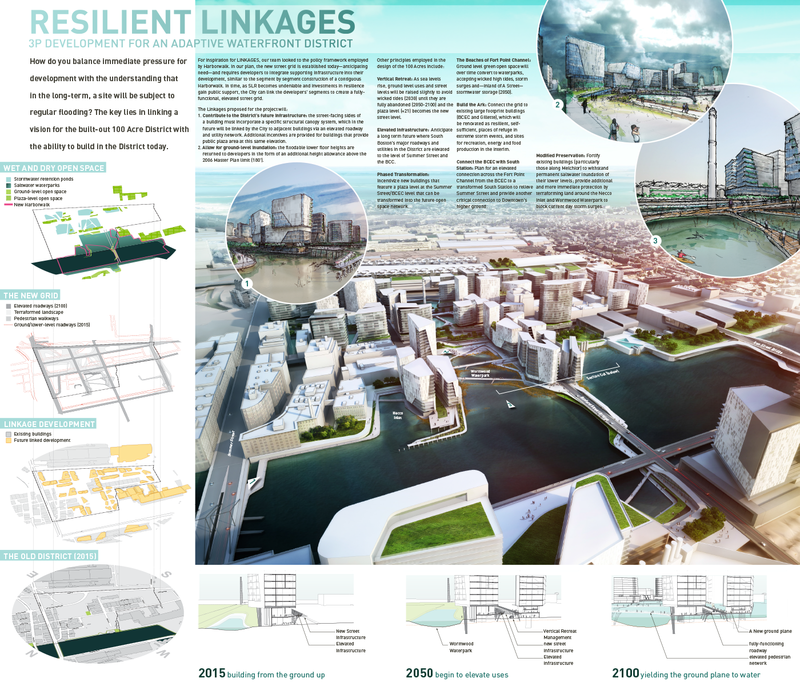 For inspiration for LINKAGES, our team looked to the policy framework employed by Harborwalk. In our plan, the new street grid is established today—anticipating need—and requires developers to integrate supporting infrastructure into their development, similar to the segment by segment construction of a contiguous Harborwalk. As SLR becomes undeniable and investments in resilience gain public support, the City can link the developers’ segments to create a fully-functional, elevated street grid. Contribute to the District’s future infrastructure: the street-facing sides of a building must incorporate a specific structural canopy system which will be linked by the City to adjacent buildings via an elevated roadway and utility network. Additional incentives are provided for buildings that provide public plaza area at this elevation. Allow for ground-level inundation: the floodable lower floors are returned to developers in the form of an additional height allowance above the current 180′ limit.